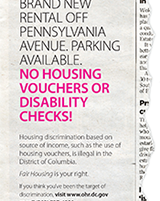 The DC Office of Human Rights' Fair Housing program was established in 1999 to eradicate discrimination in housing in the District of Columbia. In addition to enforcing local and federal fair housing laws, it conducts annual education campaigns and outreach events, including the annual Fair Housing Symposium in partnership with District government agencies and community partners. 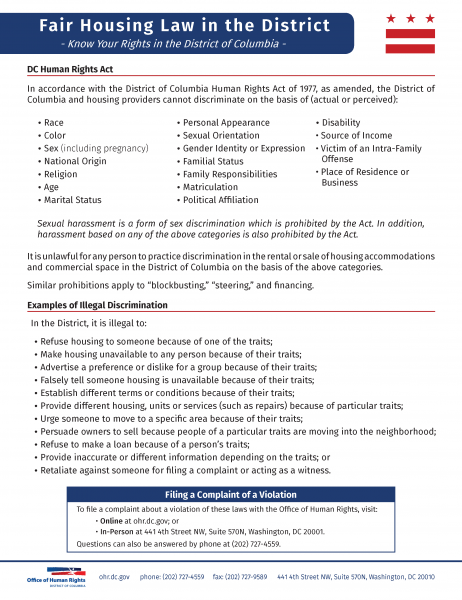 The Equal and Inclusive Housing: Knowledge for Stakeholders webinar – presented by the District of Columbia Office of Human Rights – provides an introduction to housing discrimination in the District, including local and federal fair housing laws, and to the process of reporting complaints of discrimination to the Office of Human Rights. 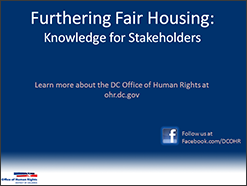 Originally airing April 11, 2013 -- the 45th anniversary of the Fair Housing Act of 1968 -- the webinars are made available in English, Amharic, Chinese, French and Spanish, and are available to those interested in learning or teaching others about DC and federal fair housing laws. Scripts are also provided for download in each language. View all the webinars and scripts. 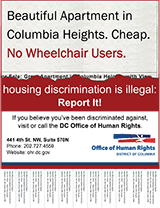 Fair Housing Posters: Post to Help Further Fair Housing! 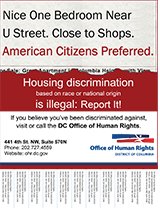 Help us in our efforts to eradicate housing discrimination in DC by printing and posting these fliers in your community centers, workplaces and other areas where people could benefit from knowing about fair housing. Help us make change here in DC by spreading the word! 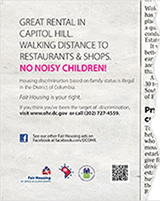 This summer, the Office of Human Rights has launched an ambitious advertising campaign aimed at educating DC residents about anti-discrimination laws in housing, in hopes of reducing discriminatory incidents and increasing reporting. 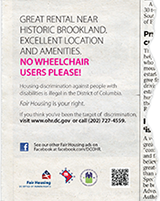 The advertisements will focus on five of the DC Human Rights Act's 19 protected traits: people with disabilities, sexual orientation, gender identity, source of income (such as the use of housing vouchers) and familial status (such as people with children). 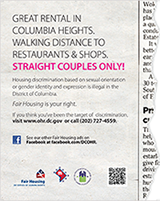 The advertisements will appear in eight newspapers throughout the District: City Paper, Express, East of the River, Washington Hispanic, Washington Afro, Washington Blade, Washington Informer and Midcity DC. 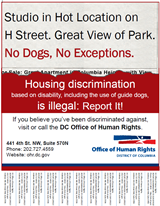 File a housing complaint in English, Amharic, Chinese, French, Korean, Spanish or Vietnamese. The DC Analysis of Impediments to Fair Housing Choice 2006-2011 Report provides information about obstacles to fair housing in the District.